In an industry such as Bollywood, where media savvy rejoinders set the agenda of an interview during a film’s promotional blitzkrieg, it is refreshing to come across a few who bring their individuality to the conversation. Tiger Shroff is clearly not one to conform to guidelines or act cagey when a few curveballs are sent his way — be it on comparison with his actor-father Jackie Shroff, his rumoured courtship with co-star Disha Patani or the criticism that Jacqueline Fernandez has faced since attempting to emulate Madhuri Dixit Nene in Baaghi 2’s repackaging of the classic song, Ek Do Teen. Starring in the sequel to 2016’s Baaghi, which paired Shroff opposite Shraddha Kapoor, this upcoming action-thriller is already creating the right kind of buzz for its adrenaline-charged dramatics akin to Hollywood legend Sylvester Stallone in the gritty Rambo First Blood 2 (1985); incidentally, Shroff is also signed on for the official remake of Rambo to be directed by Siddharth Anand. 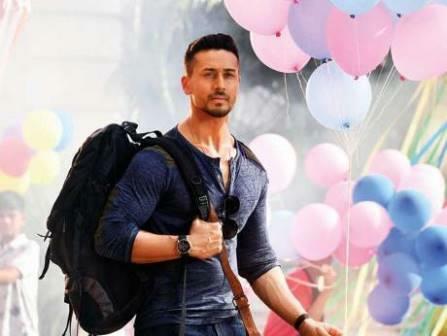 Glimpses of the scene in question are peppered through the film’s trailer, with one memorable moment witnessing Shroff catapulting off a ledge as he practically flies into a helicopter hovering above the lush jungles of Thailand. Barring superstar Rajinikanth, such a feat would perhaps appear ludicrous on many an ageing action hero that Bollywood keeps on standby. Yet, Shroff’s dexterity and his training in taekwondo and mixed martial arts keeps it real — or as real as on-screen theatrics can get. The 28-year-old plays a soldier in Baaghi 2 who is enlisted by his former lover, played by Patani this time around, to locate a missing girl. As a relative newcomer in Bollywood (this is her third Hindi film), Patani is perhaps more well known for her off-screen relationship with Shroff. However, the latter is quick to point out that his friendship with the young actress had nothing to do with her bagging the role in the upcoming sequel. A fact that cannot be denied is their off-screen rapport, which has seen Shroff and Patani be subjected to the rumour mill at regular intervals. Baaghi 2’s makers have also been facing a social media backlash for roping in Fernandez to match her steps to that of Dixit Nene from the latter’s iconic song in 1988’s Tezaab. Fernandez has borne the brunt of the verbal and written vitriol, so much so that her Race 3 co-star Salman Khan put up a public post defending her moves and lauding Fernandez for her tribute to the legendary Dixit Nene. Shroff simply doesn’t get what the fuss is all about. “I understand everyone is entitled to their own opinion, but Jacqueline has done a phenomenal job in Ek Do Teen. To subject her to such negativity is not cool. Following Baaghi 2, Shroff will soon make his way on to the sets of filmmaker Karan Johar’s sequel to his hit film Student of the Year; although the second outing will be directed by Punit Malhotra. I am very excited about being a part of Student of the Year 2,” confessed Shroff. “The franchise is Karan Johar’s baby and I am proud that he’s chosen me to take his legacy forward. However, Shroff denied that he took on the role to break away from the mould of being saddled as an ‘action star’. It is no secret that a lot was expected of Tiger Shroff when he stepped into Bollywood, what with a legacy that was left behind by his father, Jackie Shroff. The comparisons, and perhaps even the whispers on nepotism, were given fuel when Tiger’s debut film Heropanti was a loose take on his father’s first film, Hero. However, the younger star was quick to dismiss it all. It is an honour and a privilege to be compared to my father, but I always knew from the beginning that if I was to make it in Bollywood, I had to be my own man,” he stated. “I don’t want to be compared to my father, who is an iconic actor. There is no way I can match his brilliance in films such as Parinda. Baaghi 2 is out in UAE cinemas on March 29.